Andrew Brion Hogan Goddard (born February 26, 1975) is an American film and television screenwriter, director, and producer. He began his career as a writer on acclaimed television series, such as Buffy the Vampire Slayer, Alias, and Lost. He also created the Netflix superhero series Daredevil. Goddard received further recognition for writing the successful monster horror film Cloverfield (2008) and the action horror film World War Z (2013). Goddard then wrote the screenplay for the acclaimed science fiction film The Martian (2015), for which he won the National Board of Review Award for Best Adapted Screenplay and received a nomination for the Academy Award for Best Adapted Screenplay. Goddard co-wrote and made his directorial feature film debut with the horror-comedy film The Cabin in the Woods (2012). He also directed, wrote and produced the mystery thriller film Bad Times at the El Royale (2018). Goddard was born in Houston, Texas and was raised in Los Alamos, New Mexico, the son of Colleen Mary (Hogan), a teacher, and Dr. Laurence Woodbury Goddard. He attended Los Alamos High School and graduated in 1993. He then enrolled in University of Colorado Boulder and graduated with B.A. in English in 1997. Goddard started his career as a staff writer for Buffy the Vampire Slayer and Angel, receiving a Hugo Award for Best Dramatic Presentation for the former. In 2005, he joined J. J. Abrams' Bad Robot team, where he wrote for both Alias and Lost, winning—along with the Lost writing staff—the Writers Guild of America (WGA) Award for Best Dramatic Series. In 2006, during its third season, Goddard became the co-executive producer of Lost. By February 2007, Goddard wrote his first feature, Cloverfield, directed by Matt Reeves and produced by J. J. Abrams. Cloverfield made $168 million on a $25 million budget. Empire named it the fifth best film of 2008, and the film then went on to win the year's Saturn Award for Best Science Fiction Film. Goddard's directorial debut, The Cabin in the Woods, was co-written with Joss Whedon. The Cabin in the Woods was featured on Metacritic's best films of 2012 list, in addition to earning a 92% approval rating on Rotten Tomatoes. The film would go on to win the year's Saturn Award for Best Horror or Thriller Film, as well as garnering Goddard Saturn's "Filmmaker Showcase Award". In 2012, Goddard—in addition to J. Michael Straczynski, Matthew Michael Carnahan and Lost showrunner Damon Lindelof—rewrote the third act of the screenplay ahead of reshoots for the film World War Z starring Brad Pitt and directed by Marc Forster. The film grossed $540 million on a $190 million budget. As a result, in June 2013, Paramount announced that it was moving ahead with a sequel. In December 2013, Marvel officially announced that Goddard would be the executive producer and showrunner for the Daredevil television series produced by Marvel Television and broadcast on Netflix in 2015. Sony Pictures also announced that Goddard would write and direct a film based on the Sinister Six, though the project was eventually cancelled. In May 2014, Goddard withdrew from showrunning duties on the Daredevil TV series. In February 2015, after the deal between Marvel and Sony to share the rights to Spider-Man was announced, it was reported that Goddard was in talks with Sony to helm the new Spider-Man reboot film, although it was later announced that Jon Watts would be the director. Goddard also executive produced and co-wrote an episode of the miniseries The Defenders. The series featured a team-up of the Marvel Television superheroes, including Daredevil. It was released on Netflix in August 2017. Goddard wrote the film adaptation of Andy Weir's debut novel The Martian, initially planning to direct it himself for 20th Century Fox. He later left the project when offered a chance to direct Sinister Six, a now-canceled comic book adaptation based on a team of supervillains. The Martian was instead directed by Ridley Scott, and received wide critical acclaim. Goddard himself received an Academy Award nomination for Best Adapted Screenplay. Goddard wrote, directed and produced the crime mystery thriller film Bad Times at the El Royale, which was released on October 12, 2018, to positive reviews. The film features an ensemble cast, which includes Jeff Bridges, Cynthia Erivo, Dakota Johnson, Jon Hamm, and Chris Hemsworth. In 2017, it was announced that Goddard would direct and write the upcoming superhero film X-Force. The film will feature multiple superheroes, including Deadpool and Cable, whom Goddard previously wrote for as a script consultant on Deadpool 2 (2018). 7.09 – "Never Leave Me"
4.05 – "Welcome to Liberty Village"
1.01 – "Into the Ring"
1.01 - "Everything is Fine"
2.03 - "Dance Dance Resolution"
^ "Person Details for Andrew Brion Hogan Goddard, "Texas Birth Index, 1903-1997" — FamilySearch.org". ^ a b "The Goddard book". ^ "LAHS Graduate Makes Good in Hollywood: Catch his Film Tonight at the Reel Deal". Los Alamos Daily Post. 2012-04-12. Retrieved 2015-03-09. ^ "Winners Announced for 2006 Writers Guild Awards". Writers Guild of America. Archived from the original on 2013-06-16. Retrieved 2013-08-16. ^ Kit, Borys; Siegel, Tatiana (July 6, 2007). "Paramount Rolls In The Cloverfield". The Hollywood Reporter. Retrieved April 20, 2018. ^ "Drew Goddard Joins Daredevil on Netflix". Marvel. December 6, 2013. Retrieved December 6, 2013. ^ Dominic Patten. "Sony Sets Spider-Man Spinoffs 'Venom,' 'Sinister Six' With New "Franchise Brain Trust"". Deadline. ^ "Spider-Man Spinoff 'Sinister Six' Names Director". The Hollywood Reporter. Retrieved 2014-04-07. ^ Goldberg, Lesley (May 24, 2014). "Marvel's Netflix Drama 'Daredevil' Taps New Showrunner (Exclusive)". The Hollywood Reporter. Retrieved May 24, 2014. ^ Tilly, Chris (June 17, 2015). "Matt Damon Explains Why The Martian is a Love Letter to Science". IGN. Retrieved September 12, 2017. ^ Jeff Sneider (April 9, 2014). "Drew Goddard Exits 'The Martian'; Matt Damon Eyed to Star (Exclusive)". The Wrap. Retrieved April 12, 2015. ^ "Bad Times at the El Royale". Comingsoon.net. 23 August 2017. Retrieved 15 November 2017. ^ Fleming, Mike (8 September 2017). "Drew Goddard To Direct, Write 'X-Force' With Deadpool Leading Black Ops Force At Fox". Deadline. Retrieved 29 August 2018. ^ Fleming, Mike (8 September 2017). "Drew Goddard To Direct, Write 'X-Force' With Deadpool Leading Black Ops Force At Fox". Deadline. Retrieved 8 September 2017. ^ Hipes, Mike (23 October 2017). "Drew Goddard To Write & Produce Fox's 'Nevermoor' Film". Deadline. Retrieved 15 November 2017. ^ Fleming Jr, Mike (10 May 2017). "Ridley Scott, Drew Goddard, Fox & 'The Martian' Team Set 'Wraiths Of The Broken Land'". Deadline. Retrieved 15 November 2017. 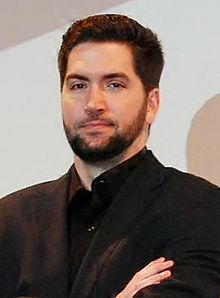 Wikimedia Commons has media related to Drew Goddard.